The inners of Fuji’s popular compact camera in a smaller body. The Fuji X70 is a lightweight, stylish camera that can be used by both hobbyists and professionals. On top of this, it also solves problems users have faced with previous Fuji models. Fuji’s compact cameras have proved very popular both with users and photography websites, but some find the APS-C format X100T too big and the 2/3-inch sensor in the X30 too small. Well the X70 could be just right. The new camera is aimed at enthusiast and pro photographers, and potentially artists, who want a compact camera with the better- than-average image quality that a larger sensor provides. There’s the traditional styling and control with a lens ring for aperture adjustment. It has markings running in whole stops from f/2.8 to f/16 – and adjustment in 1/3 stops. It has similar controls to X-series compacts, and a lens ring for aperture adjustment. 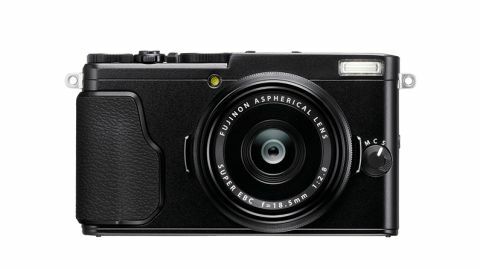 This new camera has the same 16.3MP APS-C format X-Trans CMOS II sensor and EXR Processor II as the X100T. However, these are joined by a new Fujinon 18.5mm f/2.8 lens which gives an effective focal length of 28mm, significantly wider than the 35mm (equivalent) lens on the X100T. There are also digital ‘teleconverter’ options that crop images to replicate 35mm and 50mm framing with interpolation to maintain image size. With its decent quality images, delightful retro-style body and light footprint, it’s an ideal camera to have handy in your bag for shooting reference, or even model shots in the studio. This article was originally published in ImagineFX magazine issue 135. Buy it here.